to turn your inbox into a recipe index. 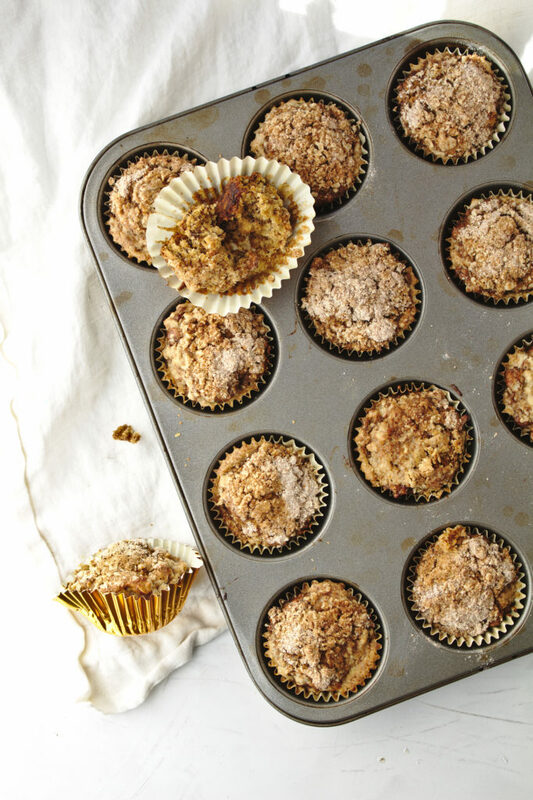 Roasted bananas and unrefined ingredients make these banana muffins delicious and healthy. With a streusel crumb topping, you can't go wrong. I developed this recipe for a vegan brunch class I taught in NYC, and they were always a big hit! 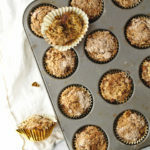 These banana streusel muffins and I go way back. I developed these for a vegan brunch class that I taught in New York! I guess the class was a success because they let me teach at least three times. Sometimes repetition is the mother of invention because after about 15 rounds of testing, it occurred to me that I could roast the bananas to concentrate the banana flavor. Woah baby. That was a good insight. We are talking PRO SECRET ALERT — roasting bananas is turning the key to unlock natural sugars that actually caramelize. Look closely and you’ll see steam escaping from the black skins, and little bits of caramelized flavor bombs. It’s these little moments that get my heart racing. There’s nothing I love more than the magic of discovering new ways to access deeper flavor profiles. This is the essence of a frayed apron moment–had I only made these muffins the one time, I would have settled for good, not realizing there was an even better! Now, I’m not interested in specializing in vegan recipes, but if I have a recipe that is vegan and it’s great as-is, then I’m pretty happy to point that out. It’s fun passing along recipes that I consider fool proof. Part of what makes this fool proof is the knowledge that so many people have made it successfully in my classes, but it’s also the nature of baking with fruit. Something about fruit in baking makes it a little less important that you have this or that ingredient perfectly measured. For example, you can easily make these with pastry flour instead of whole wheat. Not only is fruit forgiving with measurement variation, it’s the reason why we get away with a very small amount of added sugar. Seriously, bananas make these so moist and delicious, that I’ve never wanted them to contain anything heavy. Some of the links on this page are affiliate links, which may pay me a small commission for my referral at no extra cost to you! 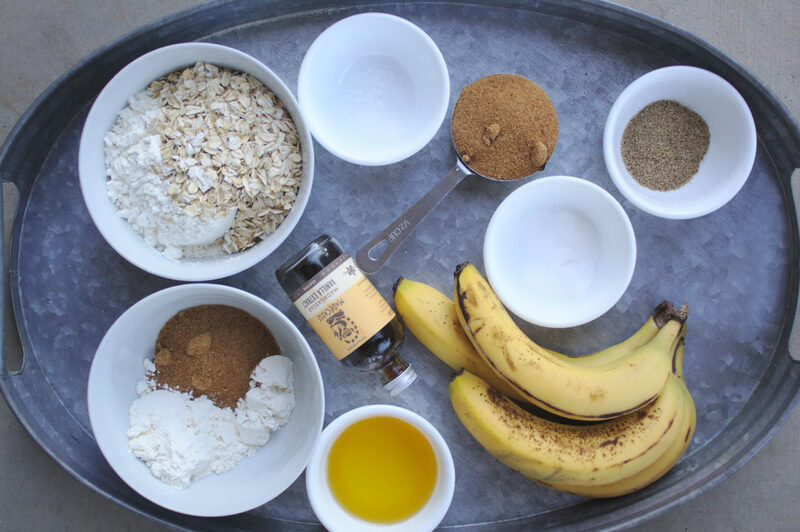 Roasted bananas and unrefined ingredients make these banana muffins delicious and healthy. With a streusel crumb topping, you can’t go wrong. I developed this recipe for a vegan brunch class I taught in NYC, and they were always a big hit! 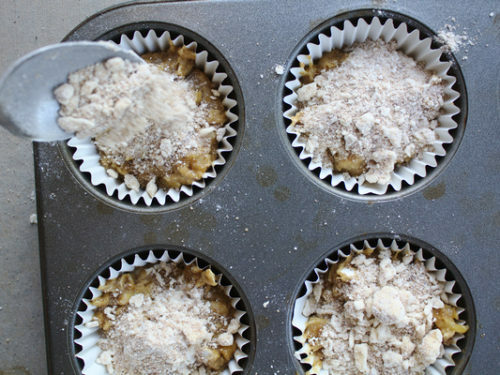 Preheat oven to 375°F and prepare a muffin tin with muffin cups (will make up to 14 muffins). 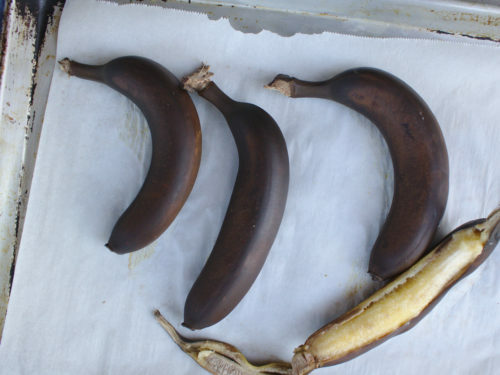 Optional: Roast the bananas in their skins to draw out moisture and caramelize the sugars, approximately 10 minutes. 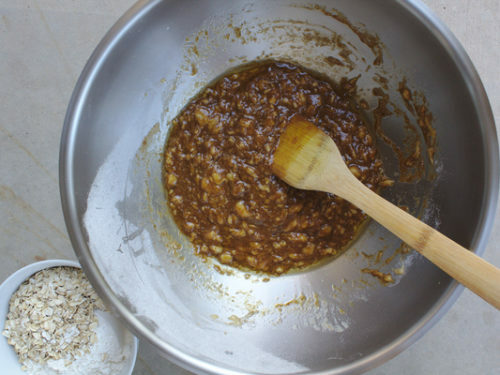 In a large mixing bowl, prepare the flax egg, whisking to form a gel. Meanwhile, make the streusel. 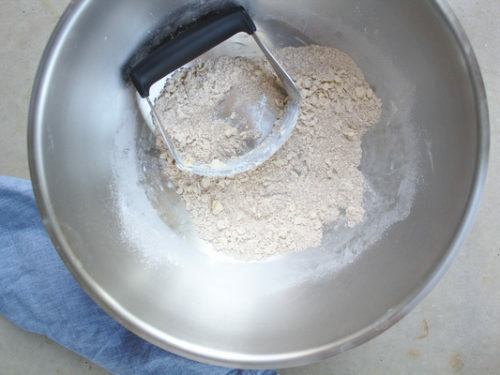 In a separate bowl, add streusel ingredients and mash with a pastry cutter until crumbly like wet sand. Set aside. 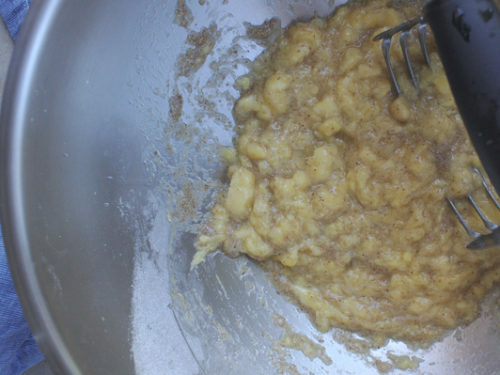 After the flax egg becomes gel-like, add the banana and mash well. 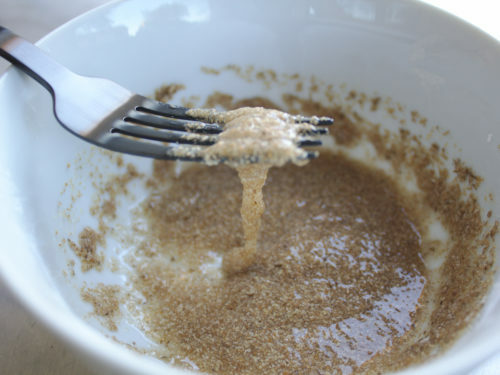 Add coconut sugar, baking soda, and salt. 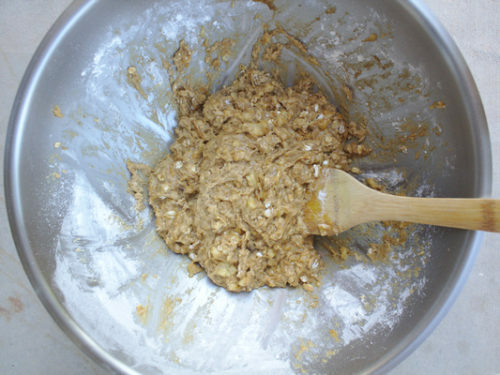 Mix to combine, then add melted coconut oil (refined will not impart a coconut flavor) and vanilla. Stir to combine. Divide batter evenly among 14 muffin liners (about 1/2 way full). 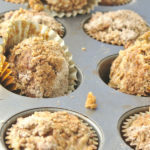 Generously sprinkle the streusel mixture over the top of each muffin. Bake for 17 minutes until the tops are golden brown and a toothpick comes out mostly clean. Let cool for 20 minutes and serve warm. Store in a sealed container at room temperature for up to 3 days or freeze for longer storage. Substitutions: Flax gel egg is made from ground flax seeds. To start from whole flax, use a coffee grinder or mortar and pestle to grind into a fine powder. Ground chia seeds can be used in place of flax. Notes: Test the temperature of your oven using an oven thermometer. Any fluctuations in oven temperature will affect the amount of time you bake these muffins. If after 17 minutes, the tops do not spring back easily when touched, leave them in the oven. Test every 3 additional minutes. Did you try this recipe?Mention @thefrayedapron or tag #thefrayedapron! Thank you for being here! Did you make this recipe? Click on the star rating or leave a comment below. I’d love to hear how you got on. Connect with me @thefrayedapron on Instagram or Pinterest. Join the mailing list for more next level recipes. Welcome to The Frayed Apron. Cuban Pork Shoulder: To Roast or To Slow Cook?